When a country runs a trade deficit and imports more than it exports, like the US economy, producers in other countries are by definition receiving a greater value in US dollars from selling in the United States than the value of the foreign currency that US producers are receiving from exporting abroad. Through the windings of the foreign exchange markets and the international financial system, these US dollars are invested or loaned back into the US economy. In this way, a trade deficit is inevitably accompanied by an inflow of investment capital. The long string of US trade deficits means that, over time, the US has become a debtor economy, which can be defined as an economy where the total amount that foreigners have invested over time in the US economy is greater than the total amount that US investors hold in the economies of other countries. 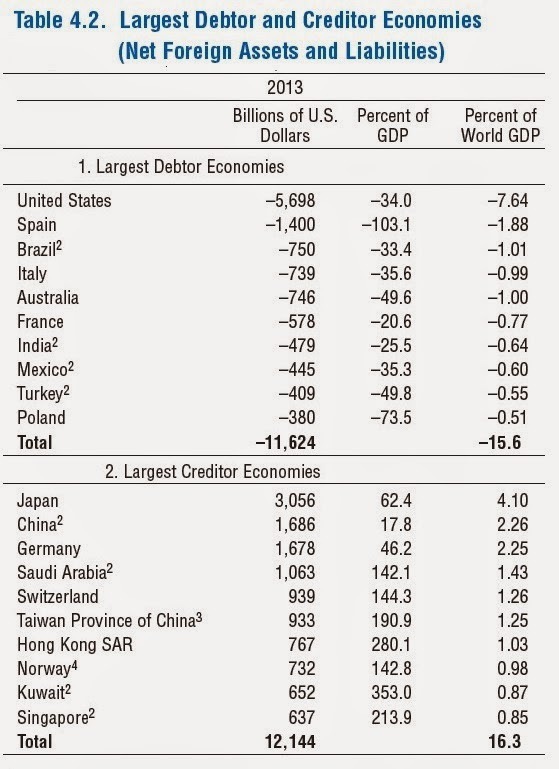 Here's a table from the IMF (specifically, it's an edited version of a table from Chapter 4 of the October 2014 World Economic Outlook) showing the biggest debtor and creditor economies around the world. In absolute size of net foreign liabilities, the US leads the way, although as a share of the US GDP, the US position looks less worrisome. The IMF report gives as a very rough guideline that when the net foreign liabilities of a country exceed 60%, there is reason for heightened concern. On this list, Spain and Poland exceed that threshold. The biggest creditor economies, based on mostly running trade surpluses over the years, are who you would expect: Japan, China (along with Hong Kong and Taiwan), Germany, and some big oil exporters. Here's the evolution of US net international investment position, as shown by the size of foreign assets and liabilities, in the last few years (from the March 31, 2015, press release by the US Bureau of Economic Analysis). In the last few years, the gap between US assets and liabilities has clearly been rising. Just to be clear, these are not assets and liabilities of governments--although they include foreign assets and liabilities of government--but they are mainly foreign assets and liabilities of private-sector firms and individuals. Dinah Walker at the Council on Foriegn Relations offered a summary of "Foreign Ownership of U.S. Assets" in a brief report on January 21, 2015. 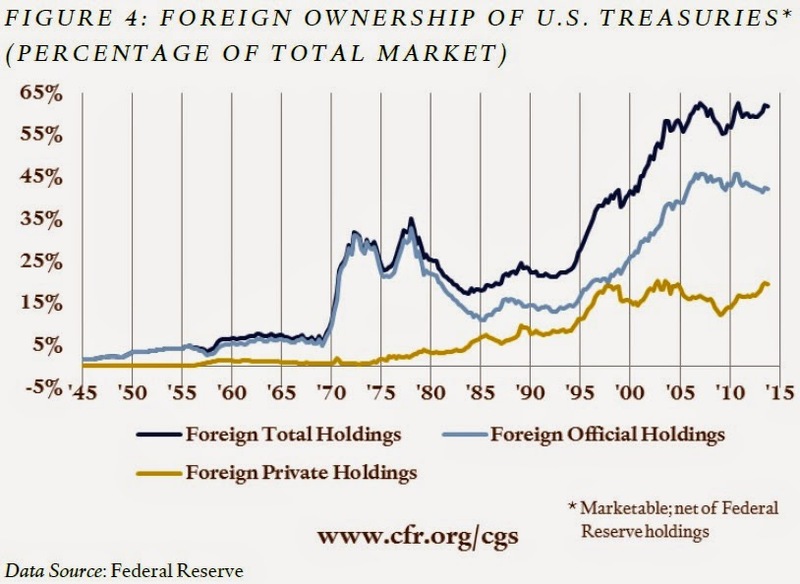 For example, in terms of US Treasury debt, foreign investors now own more than half of the total market, with a large share of that in "official holdings" by foreign governments. 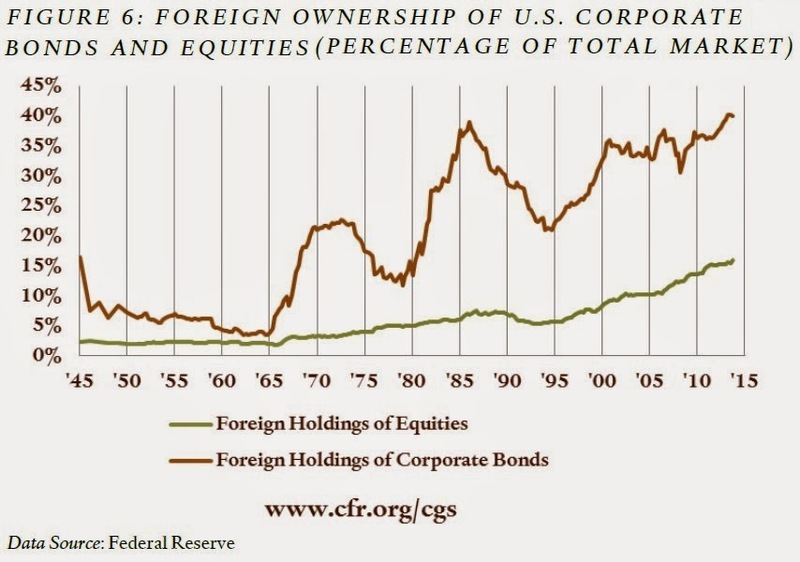 Foreign holdings of US corporate debt and stocks also show a rising trend. Among the major debtors, the key exception to the trend of diminishing vulnerability is the unique case of the United States, whose net foreign liability position is projected to deteriorate from 4 percent of world GDP in 2006 to 8.5 percent of world GDP in 2019. Indeed, one of the concerns with growing global imbalances in the mid-2000s was the (admittedly remote) possibility of the U.S. liability position suddenly reaching a tipping point, after which private and public holders of U.S. assets would lose confidence, and the U.S. dollar would lose its reserve currency status. The U.S. net liability position in fact worsened to almost 8 percent of world GDP in 2013, but for a number of reasons, the likelihood that the dollar will lose its reserve currency status seems substantially lower than it did eight years ago. First, projected flow deficits of the United States are now considerably smaller than they were in 2006. Second, the U.S. dollar continues to be the leading transaction currency in foreign exchange markets and a key invoicing currency in international trade. It accounts for a dominant share of all outstanding debt securities issued anywhere in the world and especially of those securities sold outside the issuing country in a currency other than that of the issuer. Third, dollar assets held in central bank reserves are not excessive in relation to central banks’ “optimal” currency portfolios.Fourth, at present, the dollar has relatively few competitors, since being a reserve currency requires that a substantial stock of assets be denominated in that currency. Fifth, and perhaps most telling, during the global financial crisis—whose epicenter was the United States—investors rushed for the safety of the U.S. dollar. But it would be fallacious to assume that because the US debtor position is unlikely to cause a crisis, that therefore it should be viewed as an altogether healthy situation. Standard economic theory has long argued that financial capital should tend to flow from high-income countries to low-income countries, because the returns to capital should be higher in the low-income countries where capital can be so scarce. Instead, what seems to be happening in the global economy is that the US is a producer of what investors all around the world regard as safe financial assets: meaning US Treasury debt, as well as government-guaranteed debt backed by mortgages and corporate debt. Meanwhile, US investors abroad are more likely to make higher-risk, higher-return investments in equities or ownership of foreign assets. Just how this balance of international risk-taking will work out over time is not fully clear. But we do know that when foreign investors own US assets, then the returns from those assets will flow to the foreign investors.